good morning and happy "hump day"! even though today is a little more gloomy than this last week has been, i actually love a good rainy day! it makes everything smell amazing and fresh! these are the days i love staying in and blogging and if i really get wild and crazy, i may even turn on my fireplace and make some hot cocoa. we'll see. i haven't gotten that far yet. so obviously these photos weren't taken today, ha! these were actually taken in my sweet little town of roosevelt this last weekend when we went out to visit the fam. i'm shocked you can't really tell in the photos, but the wind was kind of insane and was blowing us around like crazy, luckily, husband is a master photographer and didn't let a little wind get in his way of good shots! as for the outfit- this is my "i'm planning to drive in a car for 2 hours so i want to dress comfy but want to look semi-cute once i get there" outfit. stretchy pants (especially needed now!) and a cute chambray are always a good pick for mini road trips! then add this beautiful blanket of a scarf from the fabulous flight boutique on top and you have yourself a winner! speaking of which, i am so excited to be working with flight and if you haven't seen their adorable boutique on main street in park city, make that your next stop! amazing brands and clothes, and i can guarantee you will love every single thing! flight is actually doing a giveaway for one of these scarves right now on their facebook page! 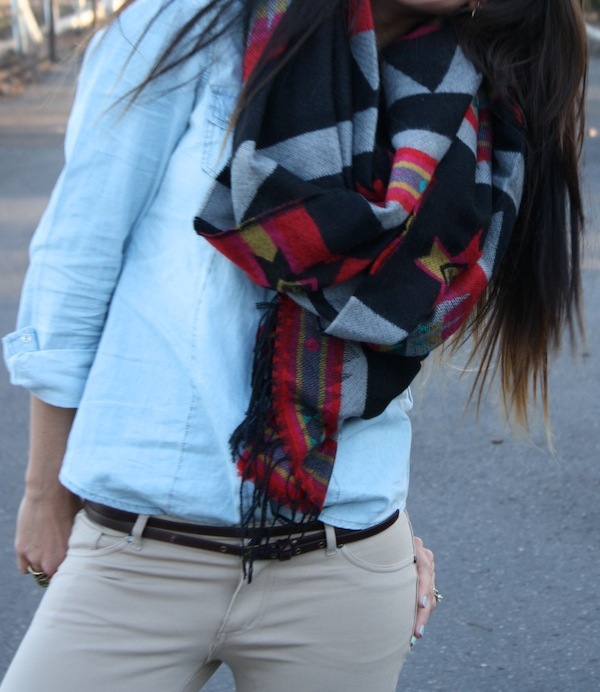 so head over and check it out to see how you could win one of these cute pendleton scarves! also, don't forget to enter the feral watch giveaway here! Rainy days can def be nice (as long as you get to stay home and enjoy it). I hate having to go to work / run errands in it. blech! Congratulations on the baby news! Rainy days are my fave. I wish for them every week, but get them like once a month in AZ. So enjoy it for me! Beautiful outfit and amazing scarve. Need that scarf. Literally need it. Thank you! And this scarf truly is to die for! Love this look! I have been looking for a great pair of oxfords.